With the economic downturn, businesses are reviewing their ambitious and expensive software implementation plans and spends in a new light. CIO’s of leading enterprises are looking at Open source and SaaS technologies as an option to combat the slowdown. 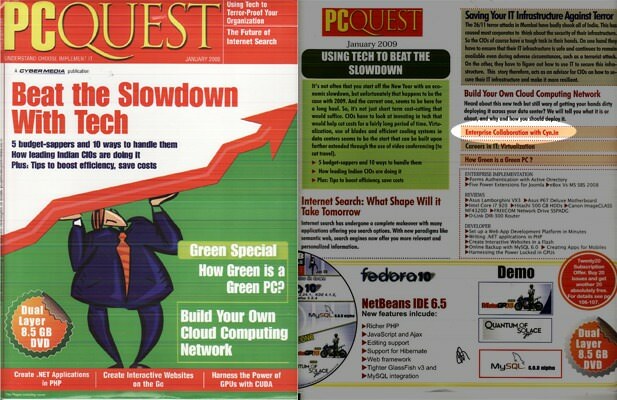 PCQuest - India’s leading technology magazine, is advising CIOs to adopt open source technologies to avoid large upfront investments and beat the recession, in the January 2009 edition. We were thrilled to see that PCQuest is recommending cyn.in to be used for collaboration in enterprises. Cyn.in can be used for collaboration, managing your electronic documents, images, and maintain proper work flow. This software offers a number of collaboration tools such as blogs, micro blog, discussion, wiki, etc. A desktop client is also available for Windows, Linux and Mac, which gets installed on the system and does not require you to visit web pages regularly to keep yourself updated. For example, whenever someone uploads a file or puts a comments, the user will just receive a pop up, and then he can visit the site. cyn.in has all the features suited for Enterprise collaboration. Its easy to install and setup, at the same time, the simple user interface makes it easy for adoption- the most critical factor for software success in organizations. The price is reasonable and companies can go with the SaaS edition or the Enterprise Edition with complete support.